The ISA bus of the original IBM PC –– as established by the IEEE P996 specification – is still fully supported today by PC/104 technology over two decades after it was created. When demand for a faster, higher-bandwidth bus emerged, the PC/104 Consortium once again followed the desktop PC by adding a PCI bus to the ISA bus. 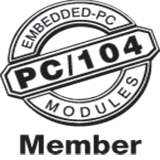 Following on, PC/104-Plus was introduced in February of 1997. By keeping the ISA bus and adding the PCI bus, this specification became an addition to the technology rather than a replacement of any existing technology. When desktop PCs stopped using the ISA bus, the PC/104 Consortium was ready with PCI-104 technology. The concept of PCI with no ISA was introduced in the original PC/104-Plus specification and was subsequently formally recognized with its own specification in November 2003. Once again, the PC/104 Consortium followed the desktop PC while keeping the legacy specifications intact. This growth pattern underscores the PC/104 Consortium’s desire to support the legacy technology while developing new solutions for the future. Longevity is a requirement for embedded systems and remains one of the hallmarks of PC/104 technology. This aspect is proven time and again by the number of PC/104, PC/104-Plus, and PCI-104 products on the market today, as well as by the number of PC/104 sites on other form-factor boards. To learn more about PC/104 Consortium organization and membership, please visit www.pc104.0g or email the organization at info@pc104.org.